Without the freedom to make critical remarks, there cannot exist sincere flattering praise - Beaumarchais. or is it only an ornamental feature ? I launched an investigation of the topic and ended drawing this 'practical' project. 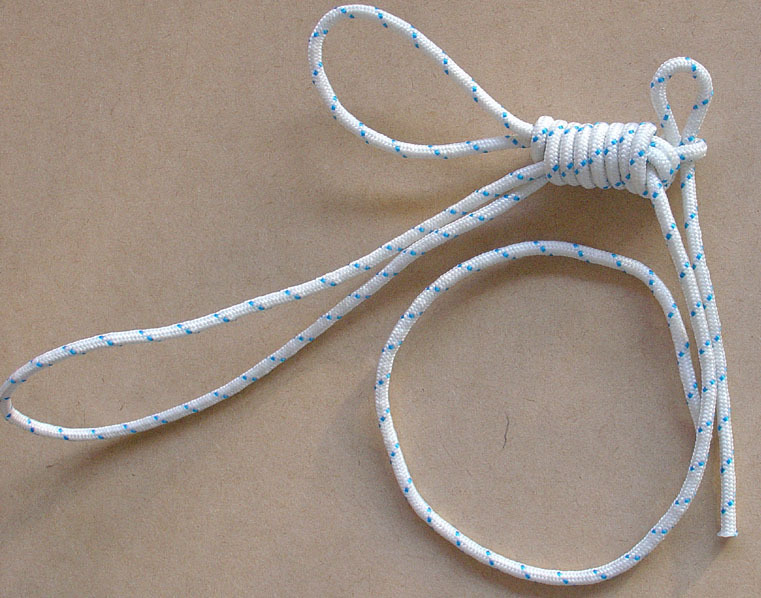 In my mind there is no doubt : possibly it may be a practical knot . 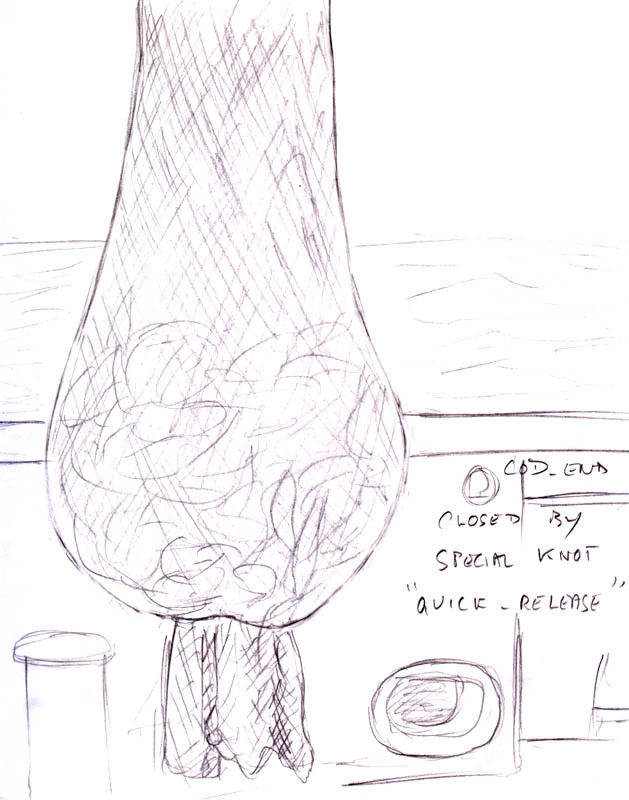 I hope this 'investigation' indicates that it is indeed a plausible practical knot. These ( one, two, three, four ) models from Le Musée National de la Marine in Paris show that it was usual for ships to carry spare masts in the 17th and 18th. Last three drawings are of 'une baleinière des Açores' / Azorean whale boat (akin to the Bedford's ones I am told ) . You will note that there is no abutment, it is just the irregularity of the mast, the ever so slight taper and the tension that keep it in place. Both boats are authentic pieces of the early 20th for the mizain sloop and 19th/20th for the whaler that actually killed whales. It was a killing instrument and no museum piece in the first part of its life. As for the mizain sloop it show much signs of having worked heavily. It was then, at that time and in these activities, essential that most of the time and attention on board could be devoted to the fishing or the hunt and that the manoeuvre of rigging be kept at the minimal level. ANOTHER MISS OF ABoK ? It is the very official appellation that figures in European Directives for Fishing ! 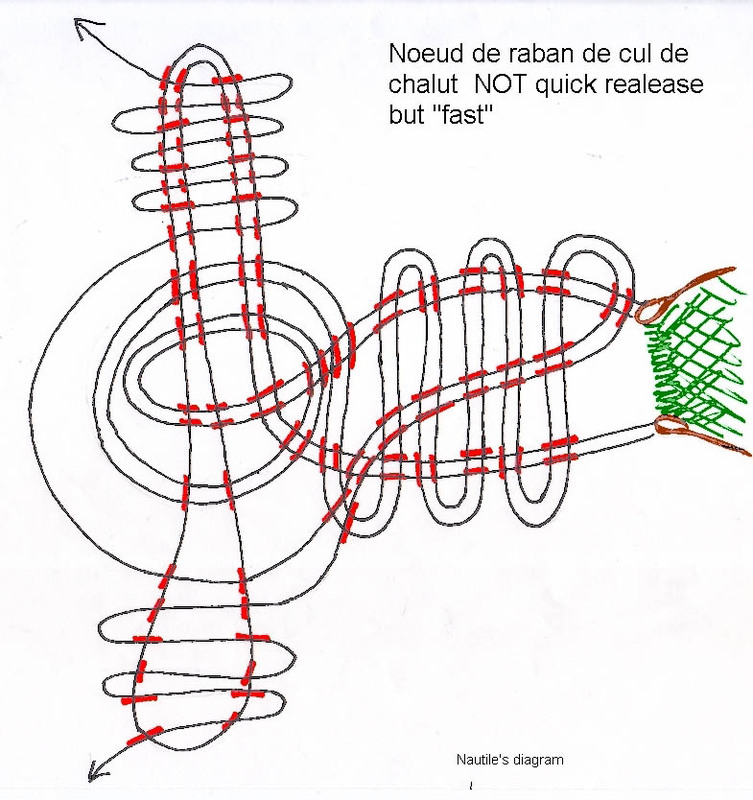 Directives allow that the roband may be unique or multiple but make it compulsory that the knot be a "quick release" to be undone just by pulling on its tails.. 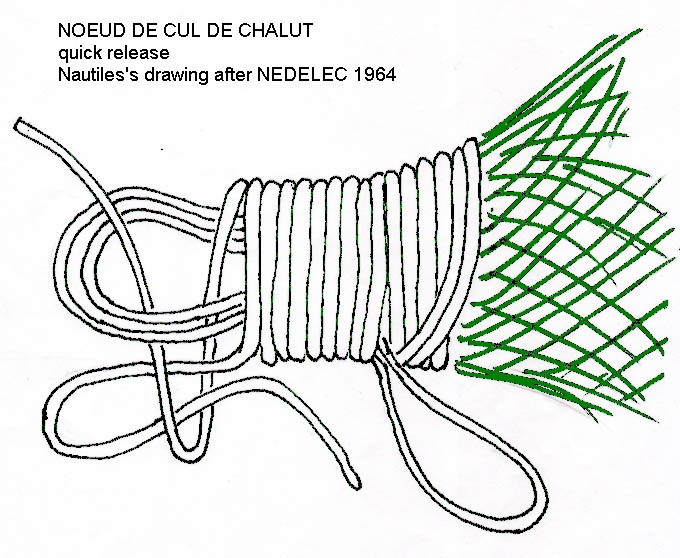 The 'cul de chalut', cod-end, is the bag or pouch end part of a trawl. 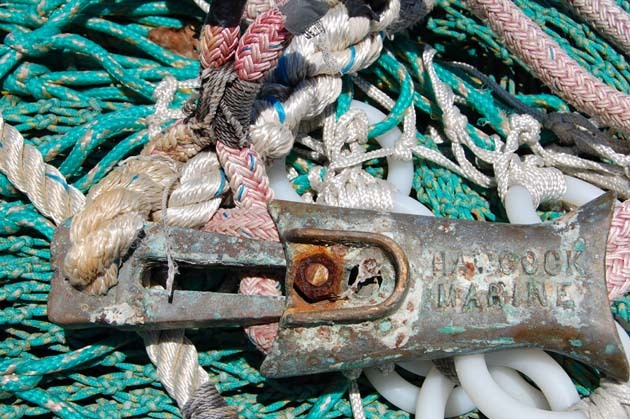 When it has been pulled on board undoing this special knot that kept it closed during the trawling time allow the catch to be emptied on the deck to be immediately "treated". I set to decipher the photography then to draw what I thought I was seeing of the knot. 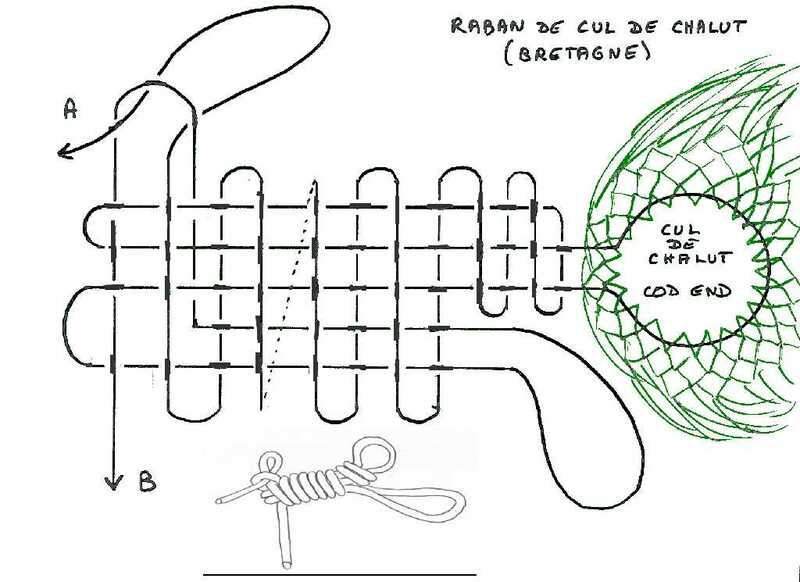 Then I 'imagined' the construction that is in this diagram and tested it 'in the rope'. 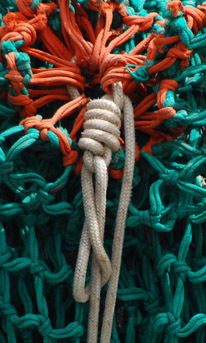 that time on the Net on fishery sites as a chain like zipper but without depiction. more than a third of a century old, in la Ville Close, conceived by locals. 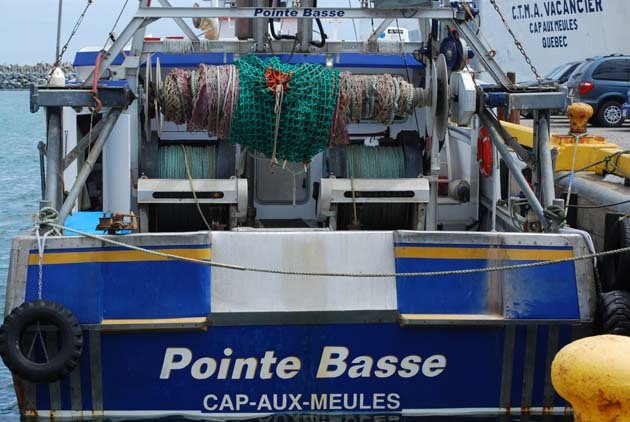 (this is the first fishing harbour of France by the tonnage sold in 'La Halle à Marée' : the professional market ). living by, with and from the sea. They are very proud of their museum and of its library which boast one of the very scarce original edition of Traité Général de la Pesche by DUHAMEL DU MONCEAU. 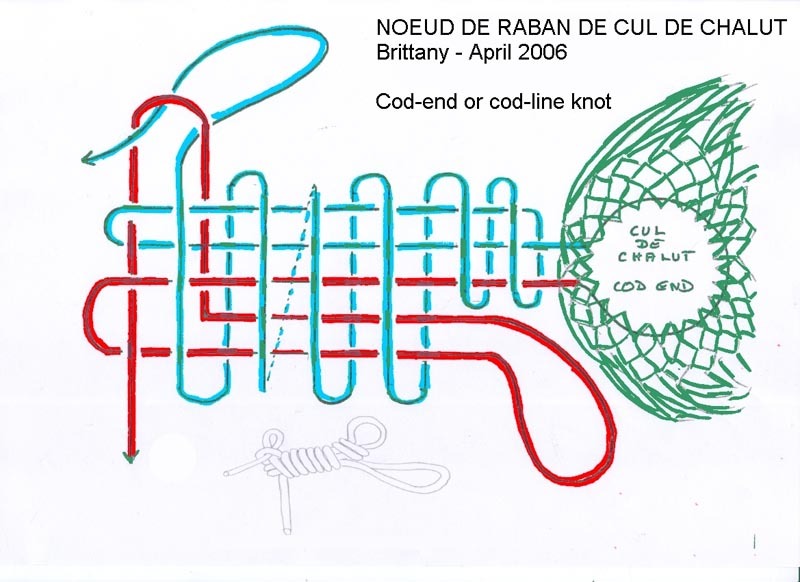 another Noeud de raban seemingly different from the preceding one. 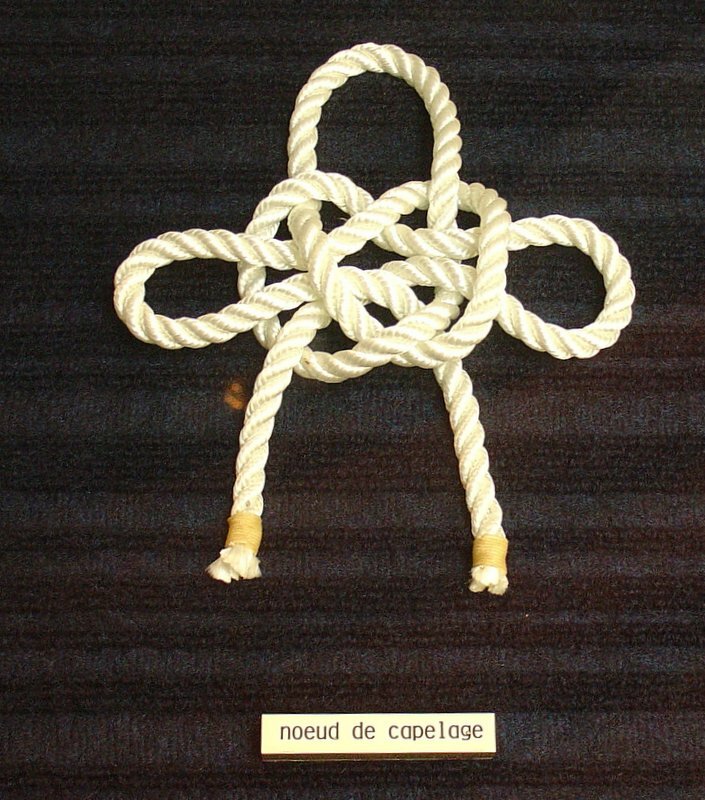 No diagram is exposed and none of my two helpers at the Musée, M. LECUIR 'General secretary and jack of all trades' and M. BECHUT the Directeur was able to give me the diagram, the knot having been made by a professional trawler man. They get here my renewed thanks. I can certify to any one being in Western Europe that this Museum is well worth the visit . You will learn a mass of things about fishing and boats. 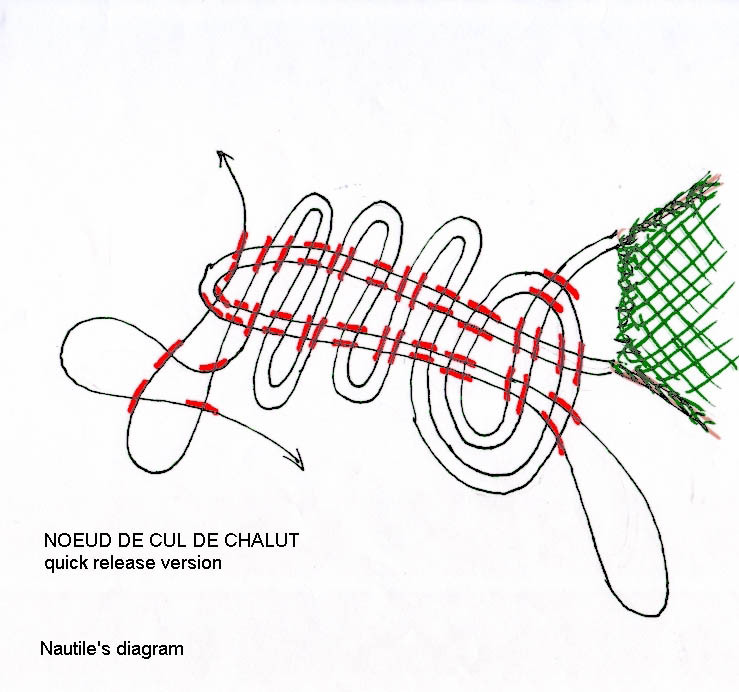 - - -" Le Chalut' ( The Trawl ) 1964 2nd edition reviewed and augmented -by C.
NEDELEC and L. LIBERT published by Institut Scientifique et Technique Des Pêches Maritimes with a wealth of drawings. 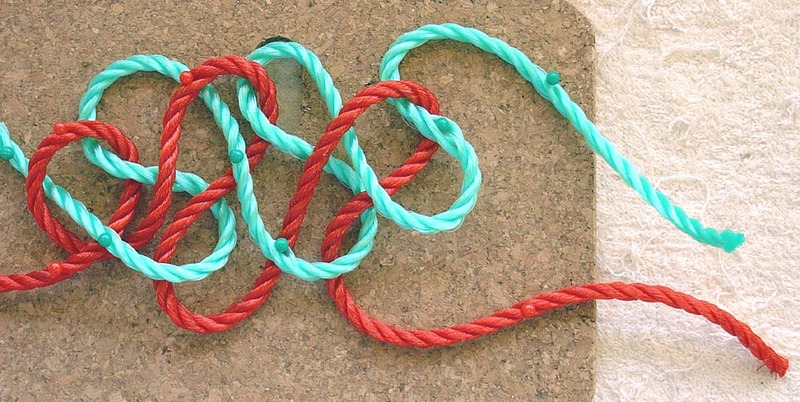 2 versions of the knots was there. - - - Le Grand Métier (1977), By Jean RECHER ( RIP) a " Capitaine Terre Neuvas, with the drawings of NEDELEC & LIBERT reproduced. 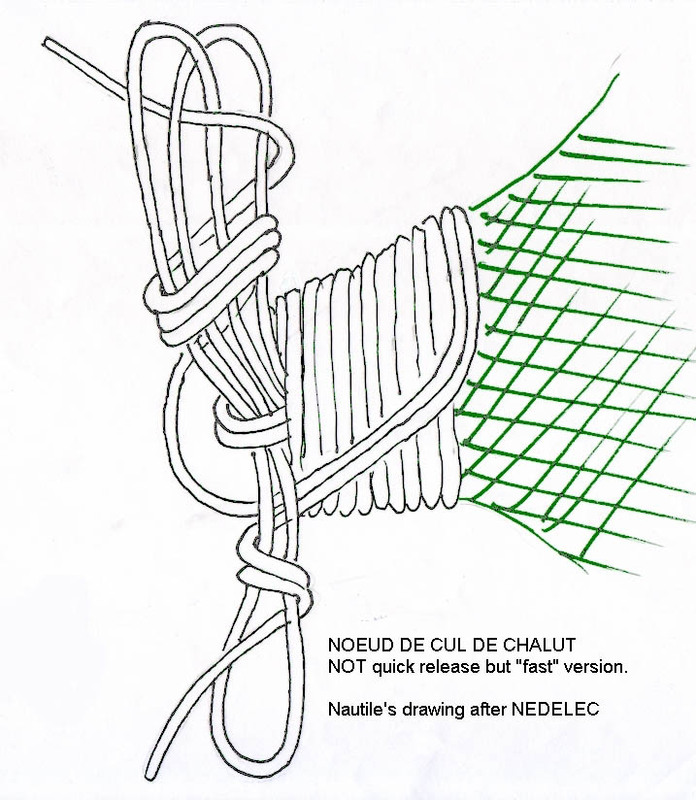 A very short time later I happen to find Anh GLOUX-BOCLE quick release version . Then I found this on the Net. If link does not work, but only for that reason, get it here, it is a "quote" from the site, but you will miss a highly interesting visit if you miss the Net link. 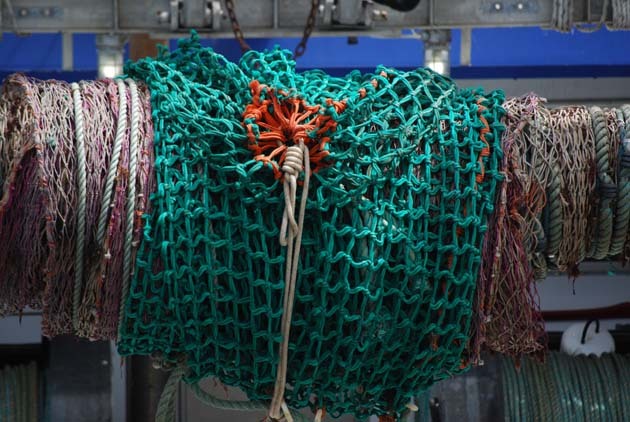 A wealth of information is there about trawling. 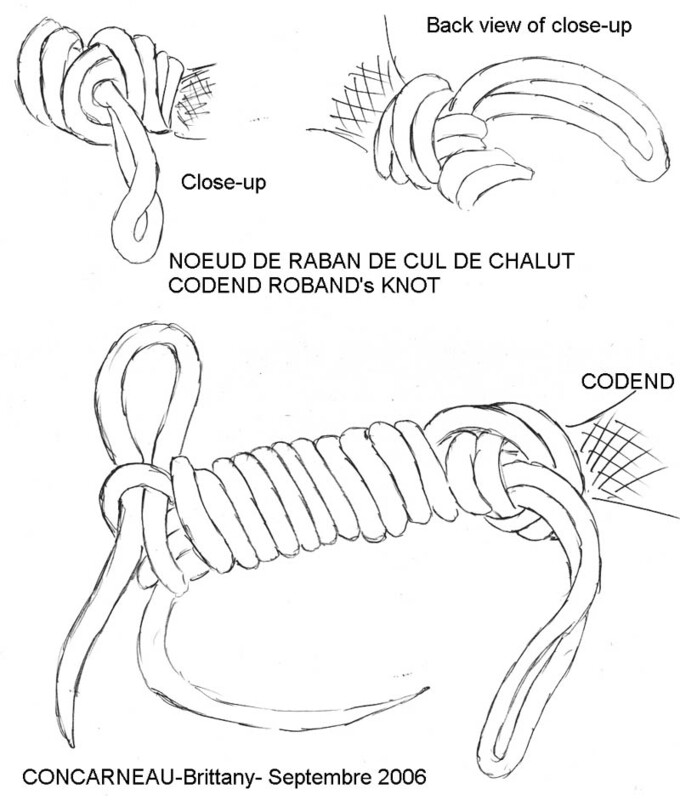 Could be an identical way to do it or a slightly different method, time and study in the rope will tell. 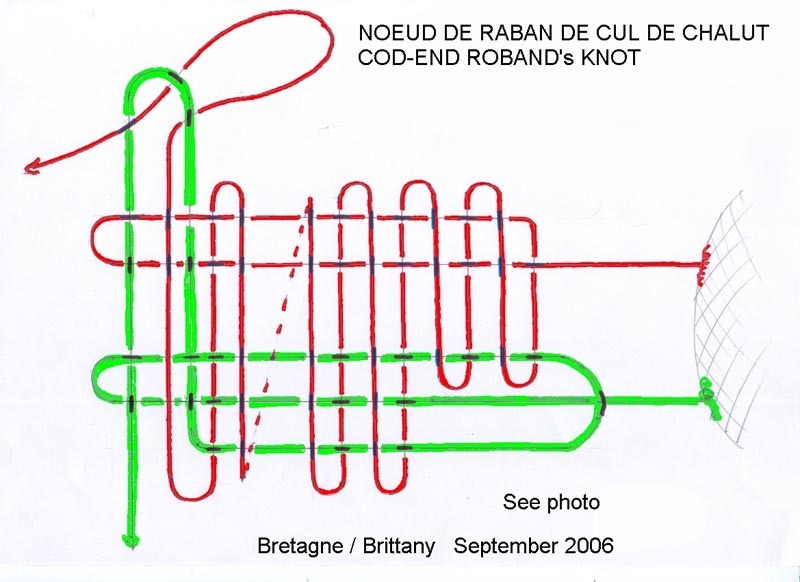 FCB ( Frank Charles Brown ) at my asking interrogated one of his friends, ex-owner of a netting fabric about it : name is cod end buster knot. My friend from the netting industry responded quickly, but did not have a lot to impart. Note the name he used--- subject of e-mail. 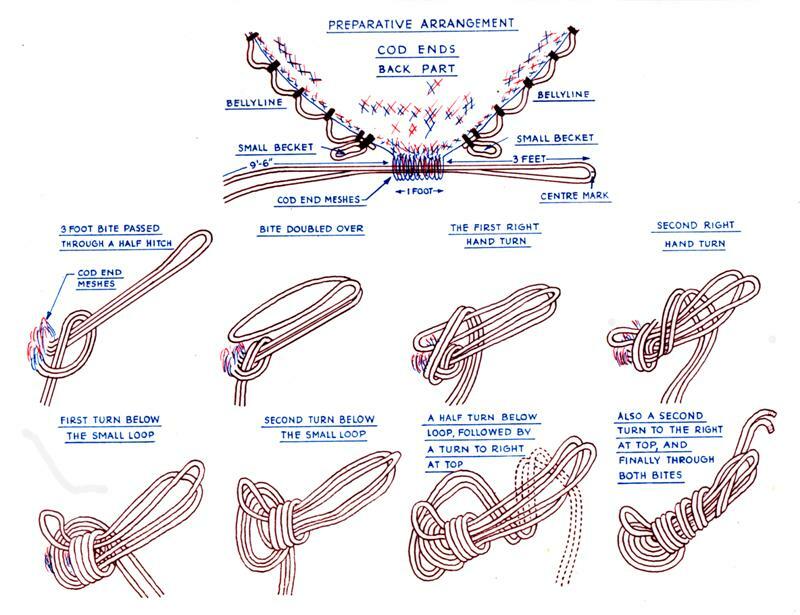 He said the knots he knows of are variations on Chain Stitch/ Monkey Knot. associated with the terms Monkey and Chain, but not immediately obvious how applied. First assumption is lots of friction holding knot in place till spilled by tugging standing part. 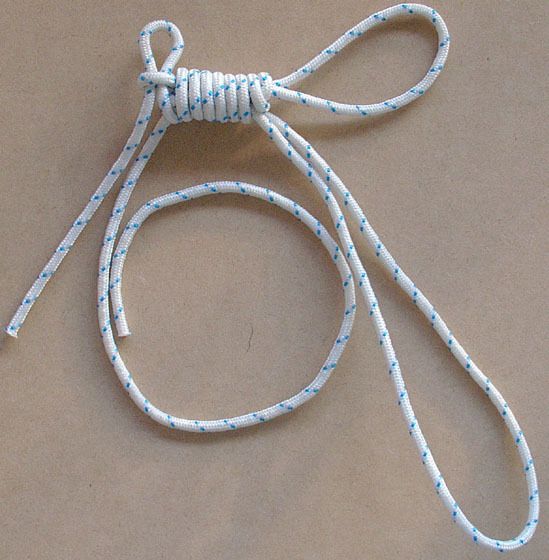 At least that confirm the sort of knot that is/was in use in Australia. The mechanical device is allowed by the European directives but I have still to see one in Brittany. This is the situation at the very end of 2006 Sept.
Joe SCHMIDBAUER (Knot News , Igkt PABT Editor, by the way why don't you join us?) 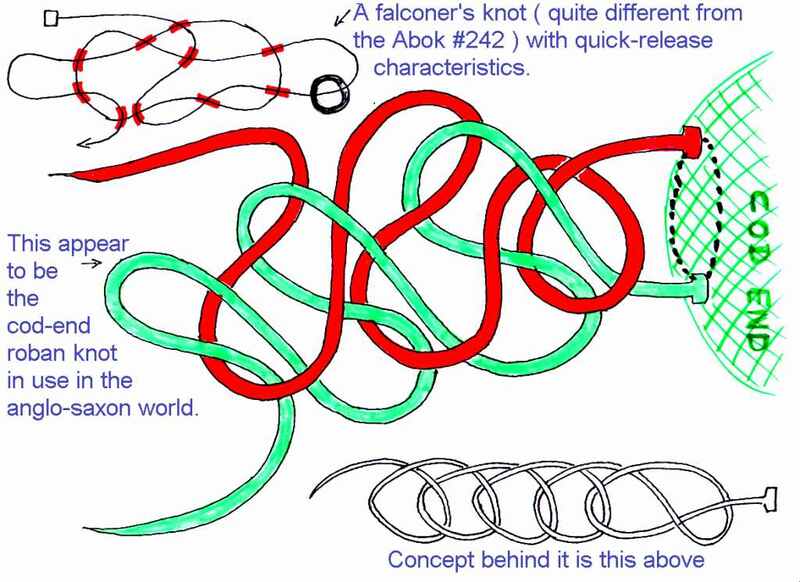 who was kind enough to send me Knot News N° 47 issued in January 2005,( author being one Pieter Van De GRIEND) knots shown in it are different from the ones I have encountered. 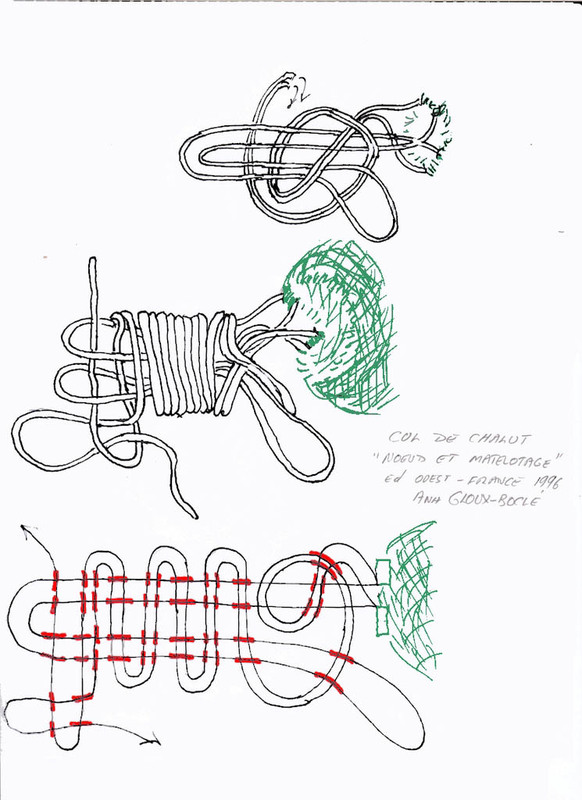 I cannot just 'extract' the drawings there so will make my own 'after' them and do diagrams and 'real knots. After much pondering following what scant contact I have had with this author I am rather under the impression that my attempt have glanced off someone rather reticent, to say the least, at the very idea of lending his works to such a web site. So I decided not to even make use of perfectly lawful " drawings after..." that do not need permission but violate the insulting and rejecting intent of the person. Leave well enough alone those who do not want dealings with you is one of my life rules. The darkest place is at the foot of the lighthouse.